We know each pet is unique and owners know their pet best. So we keep our base dog boarding rate as low as possible, and allow you to choose the level of activity that’s best for your four legged friend. Our experience has shown that high levels of physical activity and interaction result in happier and healthier pets–especially when they’re away from home. The following additional activities and services provide you with a way of letting your dog get spoiled with attention while you are away. 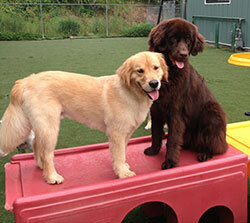 Dogs staying for the day or overnight may like to participate in our Play School program. 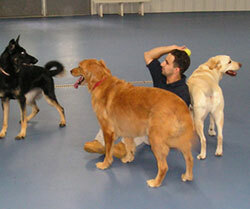 In the Play School program dogs are separated into small groups based on age, size, activity level and temperament. It is a very structured hands-on program similar to nursery school for children. Each Play School session includes open play time, obedience reinforcement, use of puppy playground equipment, outdoor play time, and lots of positive reinforcement with hands on praise. 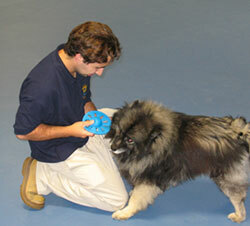 If your dog isn’t a social butterfly and prefers individual attention, we recommend our individual play sessions. These sessions provide what your dog enjoys the most — playing with a ball, taking a walk or playing with a special toy from home. You tell us what your best friend likes to do and we’ll make sure they get those special activities. Is your dog used to being pampered? Then consider upgrading your dog’s accommodations to include a premium bed while remaining in a standard room. Our canine guests can enjoy some of the yummiest and healthiest treats available. Subject to availability & cannot be combined with other offers. Discount applies to first time customers only and valid for any lodging accommodation.